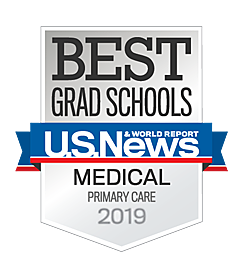 In the organization’s annual rankings of “America’s Best Graduate Schools,” U.S. News & World Report ranked primary care as #1. Our work in training the best and brightest doctor's is paying off. In the organization’s annual rankings of “America’s Best Graduate Schools,” U.S. News & World Report ranked our primary care program as #1. Several UNC-Chapel Hill graduate and doctoral programs receive high rankings as part of U.S. News & World Report’s 2019 edition of “America’s Best Graduate Schools,” but none higher than the UNC School of Medicine’s primary care ranking of Number One. SOM primary care was ranked second last year behind the University of Washington. This year, UC-San Francisco is ranked second, followed by Washington, UCLA, and Baylor. In the category of overall research, the UNC School of Medicine is ranked 23rd (tied with Emory), up one spot from last year. U.S. News ranks business, education, engineering, law, nursing and medicine programs annually, but various disciplines and specialties are only ranked periodically. This year, UNC Obstetrics and Gynecology was ranked 14th. Check out these and other rankings at U.S. News & World Report. To read an article in the Daily Tar Heel, select here. To hear an interview with Dr. Julie Byerley, the Chief education Officer of the UNC School of Medicine, listen here.